The 5 Star CC8 Cross-Cut Shredder shreds paper into 4x40mm pieces, giving it a P-4 DIN security rating. 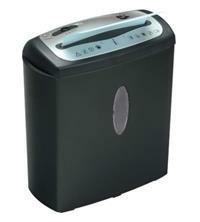 This makes it suitable for highly confidential shredding and up to 8 sheets of paper can be shredded at a time. The shredder will also shred credit cards as well as paperclips and staples, making it a hassle-free choice when it comes to having to prepare your documents for shredding. Bin capacity is 13.5 litres and features include auto start when paper is inserted into the shredder, auto stop, reverse to help clear any paper jams and a safety feature whereby the shredder will not operate if the head is not placed properly onto the wastebasket.